Sky-high home prices in Seoul are finally coming down under the weight of all-out government actions ranging from lending restrictions to higher taxes. According to data released by the Korea Appraisal Board on Friday, overall house prices in the capital fell 0.2 percent last month, making their first monthly decline in four and a half years. Apartment prices in Seoul started to ease in December last year and further dropped 0.41 percent in January. To tame the country’s runaway housing prices, the Korean government took multiple measures including a tax rise and loan regulations in September. 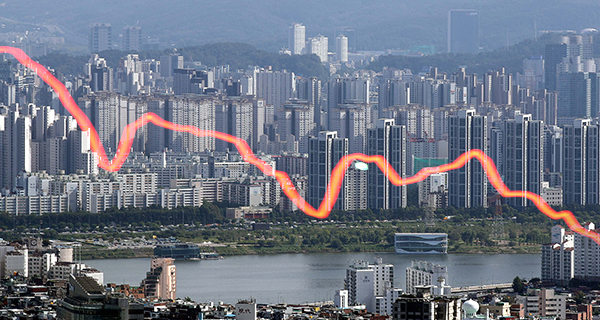 Housing prices in the Gangdong district slipped the largest 1.13 percent, and those in the affluent Gangnam area of southern Seoul also turned south. Prices drooped in almost all regions outside Seoul - Gyeonggi Province (-0.13 percent), five metropolitan cities (-0.05 percent) and rural regions (-0.15 percent). Meanwhile, domestic housing prices dipped 0.15 percent in January, retreating more from a 0.01 percent fall in December. Prices of jeonse, rent paid with lump-sum deposit for a contract for two or more years, also were down 0.22 percent across the country.